Are you a student? Click and text STUDENT for your discount! And all the other Arizona colleges! We also know how busy college life can be and we want to help. Good Works Auto Repair is happy to keep track of your preventative maintenance and send reminders to have your oil changed, have your air conditioning inspected, have your brakes serviced, have your transmission flushed and all other maintenance services to keep your car running in top shape. We are happy to talk to parent’s long distance to help answer questions and we accept credit card payments over the phone. For your convenience, we also offer a free shuttle to and from the ASU campus. 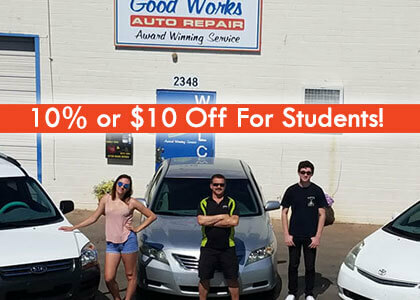 And, to guarantee that your son or daughter’s car gets the necessary care, we also offer refillable gift cards – along with a student discount coupon below. Now there’s no excuse for not getting that oil change! Good Works Auto Repair services all domestic and foreign vehicles as well as medium-duty trucks and hybrid engines. We are happy to work around your schedule at ASU so contact us today for an appointment. Our goal is to keep you safe and your vehicle trouble free!